The safety of our kids is a priority which is the reason why parents take active steps to ensure that their children are safe at all times. When moving your little one from the crib to a bed, their safety on the bed is one of the issues that make parents worried. As you may already know, this issue can be fixed by simply installing a bed rail. It is an accessory designed to protect kids as they sleep by preventing them from falling off the bed. It can also be used by teenagers, adults, and even seniors. There are many models of bed rails from different manufacturers on the market. While some of these products are worth your time, energy, and resources, others do not work to prevent your kid from falling. However, there is no need to worry as this post will furnish you with all the details you may require to make an informed decision. Read on for more information. This is the first and the most important factor to consider when looking to buy the best bed rail on the market. It is advised to go for a product that is made of top quality and durable materials. This will help to ensure that the bed rail will thrive for a long time in good condition. There is generally two type of bed rails on the market – bumpers, and bars. The former is usually made with foam with a not skid cover to hold the rail in place while also preventing your kid from falling off the bed. The latter on the other hand are made with metal or steel bar paired with a mesh cover to protect your kid while he/she sleeps. You will find that the two types of bed rails for kids have their pros and cons. The best one for you will be dependent on your preferences. When choosing the best bed rails for kids, it is best to consider going for a product that is safe. Ensure that the product is not made from any harmful material. Also, consider purchasing a bed rail that is high and long enough to prevent your little one from falling off. Avoid products that cannot be secured in place as they can be easily moved thereby allowing your child to fall off the bed. In terms of comfort, you may want to consider purchasing a bed rail that is soft, and heavily padded with a breathable material. Ease of installation is another important factor that should be considered carefully when looking to buy the best bed rail for children. Go for a product that can be installed within a few minutes without requiring professional help or special tools. Also, consider purchasing a bed rail that is easy to clean. You will find that the cover that ships with most bed rails on the market are machine washable to make maintenance easy for you. This type of bed rails will be a great choice. The Regalo Swing Down Bed Rail Guard is one of the best you can find on the market. The product is famous among parents and it has received many positive reviews and ratings from past users. This is probably due to the amazing features it packs. Also, the bed rail features a beautiful design and it comes in a white shade which will easily blend into many different bedroom decors. It is made from top quality materials that will allow your kid to enjoy all the benefits the product has to offer for a long period of time. The bed rail features a top quality steel frame paired with a mesh cover to keep your little one safe and comfortable. The mesh cover is removable and machine washable to make it easy for you to maintain. Also, the Regalo Swing Down Bed Rail Guard is easy to use even for toddlers. This is because it features a swing down functionality that makes it easy for kids to get in and out of bed. The feature will also go a long way to make it easy for you to change your little one’s beddings. With the Regalo Swing Down Bed Rail Guard, you don’t have to worry about your kid’s safety as the products feature an anchoring strap that can be used to couple it with the bed. This feature paired with the durable steel frame will help to secure your little one’s safety. Also, the bed rail is long and tall to further enhance safety. It has a length of 43 inches and a height of 20 inches and it is certified as safe by the Juvenile Product Manufacturers Association and American Testing Society. The Regalo Swing Down Bed Rail Guard is lightweight as it weighs only about 0.32 ounces. It is easy to set up since you can complete the entire process within a few minutes without requiring any special tool. Also, the bed rail is designed to be used only with box spring and bed and it will perfectly fit twin and queen size beds. If you decide to purchase this product, you will find that it is seamless under your kid’s bed and comfortable to sleep on. It is offered at an affordable price and looking at the features it packs, one may safely conclude that it offers a good value for money. Most users of the Regalo Swing Down Bed Rail Guard are satisfied with its quality, safety, and durability. However, some users complained that the cover that ships with the product are not durable as it is likely to break after a few repeated use. Other users stated that the cover of the bed rail is hard to put on. The Hiccapop Toddler and Kids Bed Rail Guard is another amazing product on the market. It is considered one of the best bed rail for kids. Also, it is made from a reputable manufacturer that is famous for supplying top quality products to the market. The product features an ergonomic and modern design that will add styles to your little one’s room while also providing much-needed security. It comes in a bright two-tone shade that will blend with different colors of beddings as well as with other furniture and accessories in your kid’s room. Furthermore, the product is made from premium quality materials that will allow it to withstand the hassles associated with repeated use. The material is water resistant to further enhance durability in good condition. To keep the product clean at all time and make it easy for you to maintain, you will find that its cover is machine washable. If you are not satisfied with metal bed rails on the market then this bumper will be a great choice. You also don’t have to worry about keeping it in place as the bottom of the bed rail is anti-skip and silicone-beaded to keep it in place. It is safe and non-toxic to use for kids and toddlers as it is hypoallergenic, BPA-free, and chemical-free. To further enhance the safety of your little one with this product, the maker stated that the foam and other material used in making the product does not contain PBDEs, TCEP, or TDCPP flame retardants, heavy metals, mercury, formaldehyde, lead, and phthalates. Also, the Hiccapop Toddler and Kids Bed Rail Guard passed through a durability test, performance test, and emissions test by independent accredited testing labs. Unlike bed rails with steel frames, this bumper is soft and comfortable. When your little one’s body touches the Hiccapop Toddler and Kids Bed Rail Guard, he/she will be gently informed of the danger ahead thereby prompting your kid to return to the safe side of the bed without any discomfort. Interestingly, the bed rail is also safe for active sleepers thanks to its height and length. It has a dimension of about 52 x 7 x 4.5 inches which means it will provide your kid with the much need support without taking up too much space. In addition, the Hiccapop Toddler and Kids Bed Rail Guard which will make it easy for you to carry the product from place to place. It is ideal for toddler beds, twin beds, full-size beds, queen size beds, and king size beds. But it is not advised to use the bed rail on loft beds and top bunks. Although it is slightly more expensive compared to similar products on the market, many users stated that it offers good value for money. It ships with a 100 percent lifetime satisfaction guarantee to further assure you of its quality. Most users of the bed rail are satisfied with its quality and durability. Yet, a few users complained that the bed rail was not as high as advertised and will not prevent toddlers from falling off their beds. Others complained that it is hard to keep the bumper in place. If you are looking to purchase a top quality bed rail that is safe to use and offered at an affordable price, then this product will be a great choice. The Royexe Inflatable Travel Bed Rail for Toddlers and Kids is one of the best on the market to purchase. The product is available in both 1 pack and a 2 pack set. This will allow you to purchase a 2 pack set for the protection of both sides of your little one’s bed for enhanced security. The bed rail features a stylish design that you and your kid will find appealing. Furthermore, it is made from high-quality PVC material that will allow your little one to enjoy the features it packs for a reasonable period of time without worry about rapid wear and tear. The Royexe Inflatable Travel Bed Rail for Toddlers and Kids is water resistant to further enhance its durability. Unlike metal frame variants on the market that may cause your little one to feel trapped, this one is designed to be placed under your kid’s beddings. This will allow it to blend in seamless into the room’s decor. 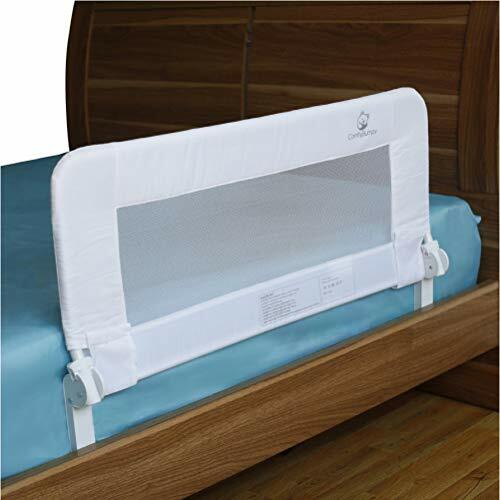 Though it is an inflatable model, this bed rail is safe for your little one as the maker stated that it features an airtight and leak-proof construction. Still on your toddler’s safety, the Royexe Inflatable Travel Bed Rail for Toddlers and Kids ships with dual non-slip grip strips at the bottom. It is designed to ensure that the bumper is secured firmly to your kid’s bed thereby preventing it from moving out of place. The product is soft and comfortable which invariably means it will gently hold your child, preventing him/her from falling off the bed. Interestingly, the maker of the product stated that it will efficiently hold up to 300 pounds of weight. Also, with a dimension of about 48 x 5 x 7 inches, one may safely conclude that the Royexe Inflatable Travel Bed Rail for Toddlers and Kids is high enough to prevent your little one from falling off. It is easy to fill the bed rail with air and deflating is a breeze as all you need to do is push the button provided for deflation. If you decide to purchase this product, you will find that it is small enough to fit into a purse or a bag when deflated thereby making it easy for you to move it around or carry it along while going on a trip.It is compatible will all bed types including twin beds, convertible cribs, queen size beds, and king size beds. Also, it has been tested and certified by the CPSC and ASTM to meet and even exceeded all child safety regulations. The Royexe Inflatable Travel Bed Rail for Toddlers and Kids is offered at a budget-friendly price and it ships with a 100 percent satisfaction guarantee to further assure you of its quality. Most users of the product are satisfied with its quality and durability. Nevertheless, a few users complained that the bed rail is not as durable as claimed by the manufacturer. Others stated that the product is not airtight as it may deflate on its own thus posing a risk to your kid’s safety. The Shinnwa Toddler Bed Rail Bumpers for Kids is another amazing product you should consider purchasing. It ships with amazing features to keep your little one safe all night long. Also, it is specially designed to cater to the needs of infants and toddlers but it can also be adopted by teenagers, adults, and seniors. The bed rail bumper features an ergonomic design that is hard to turn away from. It is made of premium materials that will keep your baby comfortable while also preventing hazards. Just like other bumpers listed above, this one is designed to be placed under your kid’s bedding for seamless use. Unlike metal and steel bed rails, this product will constantly remind your kid if the danger that lies ahead with a gentle touch that will not disturb his/her sleep. Still, on comfort, you will find that the Shinnwa Toddler Bed Rail Bumpers for Kids features high-density memory foam padding to provide your little one with the best experience. Also, you do have to worry about the pillow moving out of place as it features a durable non-skid silicone bottom. This will help to ensure that the bed rail sits firmly on your little one’s bed thereby reducing the risk of falling off to the barest minimum. 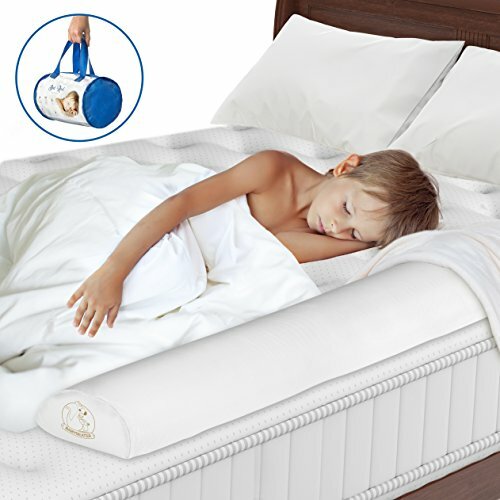 To make it easy for you to keep the Shinnwa Toddler Bed Rail Bumpers for Kids clean at all times, you will find that the cover of the product is machine washable. It is also breathable to provide your kid with the best experience. Additionally, the bumper is easy to set up as all you need to do is remove it from the pack, place it on your kid’s bed and cover with the bed sheet. It comes in a two pack set that will help your secure both sides of your child’s bed thereby enhancing protection from falling off. With a dimension of about 52 x 6.5 x 4.5 inches, the bed rail is high and long enough to protect your kid from falling off the bed. Also, it is narrow which invariably means it will provide the much-needed protection without taking up too much space. 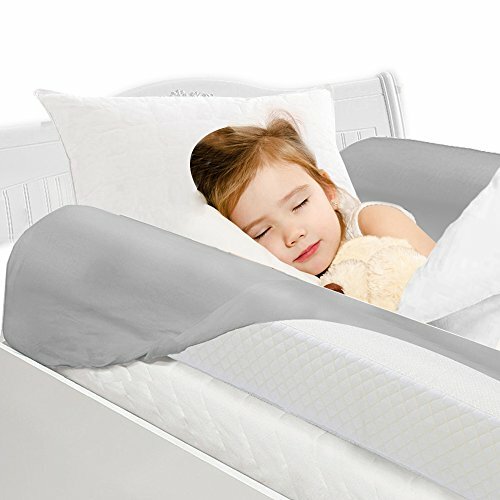 The Shinnwa Toddler Bed Rail Bumpers for Kids is CertiPUR-US certified as safe for kids. The maker of the bed rail stated that it does not contain ozone depleters, PBDEs, TDCPP or TCEP flame retardants, lead, mercury, and other heavy metals, formaldehyde, phthalates as regulated by the Consumer Product Safety Commission. In addition, the product has a low Volatile Organic Compound emission of about 0.5 parts per million for enhanced air quality indoors. The Shinnwa Toddler Bed Rail Bumpers for Kids is compatible with all bed types including toddler beds, twin size beds, full-size beds, queen size beds, and king size beds. It is cheaper compared to similar products on the market and it ships with a 100 percent satisfaction guarantee and a 30 days money back warranty to further assure you of its quality. Most users of the bed rail bumper are satisfied with its cost, performance, quality, and durability. However, a few users complained that the product does not prevent kids from falling off their bed. Others stated that it stays flat after removing it from the pack. This is one of the best bed rails for kids that you can purchase on the market. The Dream On Me Mesh Security Bed Rail is specially designed to cater to the needs of infants and toddlers but it can be adopted by different categories of individuals too. It features a beautiful and modern design that will go a long way to add style to your little one’s room while also providing much-needed support and protection. It is available in three different colors including white, blue, and pink. This will allow you to go for the shade that works best for you and your little one. The maker of the product stated that it is made from top quality materials to allow for durability even when your little one uses the product on a daily basis. It features a durable bar with a mesh fabric cover that is breathable to enhance your little one’s experience with the product. With the Dream On Me Mesh Security Bed Rail, you don’t have to worry about your kid’s safety. This is especially because unlike many similar products on the market, this one features a reinforced anchoring system. The bed rail can efficiently support up to 45 pounds of weight. In addition, it features no-catch edges to enhance your kid’s safely while also keeping him/her comfortable all night through. The maker of the Dream On Me Mesh Security Bed Rail stated that the above-listed features help to ensure that the rail is secure and stable at all times. Measuring 33.5 inches in length and 15 inches in height, the bed rail is long and high enough to guarantee your kid’s safety. It will perfectly fit convertible cribs and twin size beds. 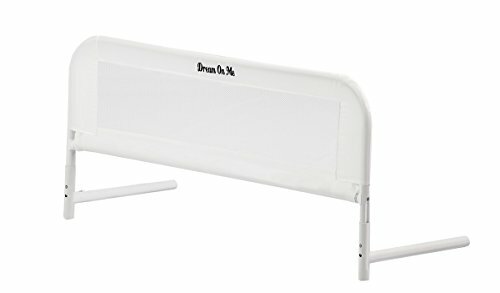 The Dream On Me Mesh Security Bed Rail is lightweight with a weight of about two pounds. This invariably means you can easily carry the product from one room to another. With this bed rail, installation is super easy as you can complete the entire process without requiring any special tool. It is easy to maintain. All you have to do is wipe the bed rail with a damp towel from time to time. The product is one of the cheapest bed rails you can find on the market and many users provide that it offers a good value for money. Most users of the Dream On Me Mesh Security Bed Rail are satisfied with its performance, quality, and durability. Nonetheless, some users complained that the product is not ideal for toddler and kid’s bed. Others stated that it is somewhat difficult to install the bed rail properly. 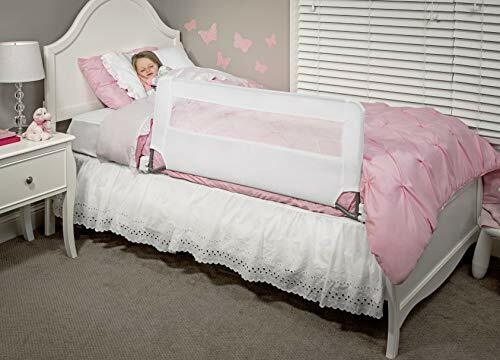 The Babyseater Bed Rail Bumper Guard is another amazing bed rail for kids that you should consider purchasing. The product is popular among parents and it is favorably reviewed by past users which may be due to the amazing features it offers. Also, the bed rail features a sturdy design that will provide your kid with all the comfort and protection he may desire. It comes in a white shade that will blend seamlessly into the decor of your kid’s room. To provide you with an even more seamless performance, this bed rail is designed to be placed under your kid’s bedsheet for the best result. It is made from premium quality polyester material that will support its durability over a long period of time. Also, the maker of the Babyseater Bed Rail Bumper Guard stated that the cover that ships with the bed rail are water resistant to further enhance its durability. Interestingly, the cover is washable and machine friendly which will go a long way to simplify the task of maintaining the bumper. The Babyseater Bed Rail Bumper Guard is soft and comfortable for kids. Unlike its metal frame counterparts, this bumper is designed to protect your kid from falling off its bed by gently reminding him of the danger ahead without disturbing his/her sleep. The bed rail is designed to sit firmly on your kid’s bed thereby making it hard to move it out of place, thanks to the non-skid bottom. Also, it is easy to install since all you have to do is place the bed rail bumper on your kid’s bed and then cover with a bed sheet. The Babyseater Bed Rail Bumper Guard is high and long to guarantee your little on’s safety by preventing him/her from falling off the bed. It has a dimension of about 11.2 x 6.2 x 6.2 inches. With a weight of about two pounds, the product can be easily moved from one place to another. It is slightly expensive compared to similar products on the market, but it ships with a lifetime reassurance to further guarantee you of the product’s quality. It will perfectly fit all types of bed including toddler beds, twin size beds, full-size beds, queen size beds, and king size beds. Most users of the bed rail bumper are satisfied with its quality, durability, and performance. Yet, a few users of the Babyseater Bed Rail Bumper Guard complained that it is hard to keep it in place. Others stated that the product is not high enough to prevent your little one from falling off the bed. It is available in one pack but if you want to protect both sides of your child’s bed, then you will have to purchase two. 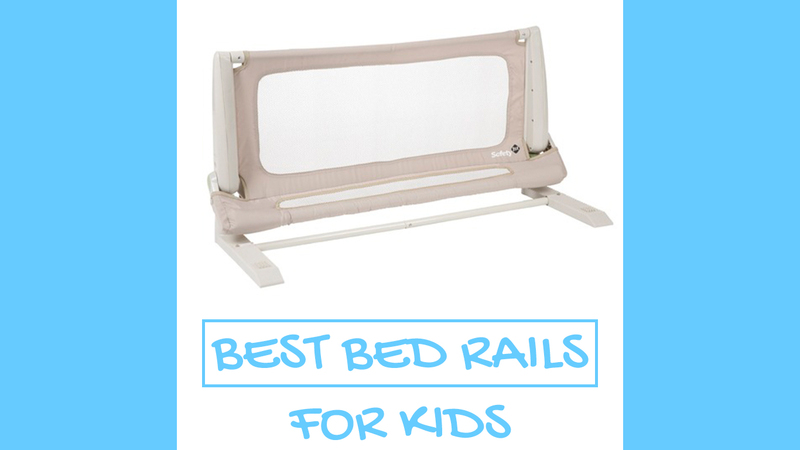 The ComfyBumpy Bed Rails for Toddlers is one of the best you can find on the market. The product is famous among parents and it has received many favorable ratings and reviews from past users. It features a beautiful design and it is available in two color variations including white and grey. All you have to do is go for the color that works best for you. Also, the bed rail is made from top quality materials that are durable which will allow it to withstand the hassles associated with repeated use in good condition. If you purchase this product, you will find that it features durable metal frames with a flat and sturdy design to support and protect your child while also ensuring that the metal is not felt under the mattress. Also, the ComfyBumpy Bed Rails for Toddlers features a high quality, and easy to clean mesh fabric for added security. The mesh material is breathable to provide your child with the best experience he can get from a bed rail. It comes with a curved and easy to let down design that will make it easy for your little one to get in and out of bed. This design will also make it easy for you to change your little one’s beddings as well as carry out minor activities on the bed without obstruction. Also, the ComfyBumpy Bed Rails for Toddlers ships with adjustable straps to make it easy for you to pair it with different types of beds. It also used velcro to connect with slat bases to enhance the safety of your child with the product. You will find that the product is easy to install and the 5 minutes video instruction provided by the maker will further make the process easy for you. The ComfyBumpy Bed Rails for Toddlers ships with screws to help you secure the base of the product while also making it easy to install. 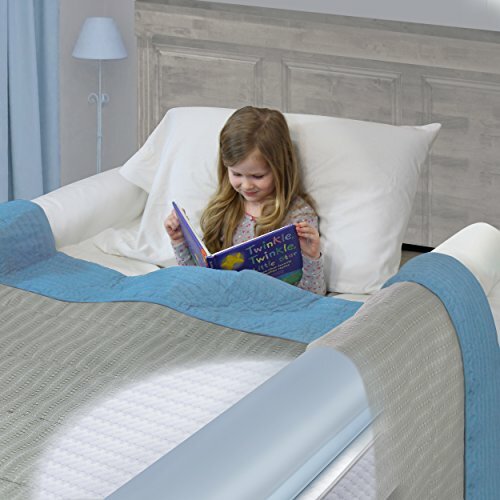 It has a dimension of about 24.8 x 3.9 x 6.1 inches which invariably means the product is high and long enough to protect your little one from falling off the bed. It is safe for kids as it is not made with any harmful material. The maker of the bed rail stated that it is ideal for toddlers that are at least 24 months of age. In addition, the ComfyBumpy Bed Rails for Toddlers will perfectly fit toddler twin beds, double beds, queen size beds, and king size beds. It is available in regular and extra long size variations. The bed rail is pricey but looking at the features it brings, one may safely conclude that it offers a good value for money. Most users of the product are satisfied with its quality, performance, and durability. But a few users complained that the bed rail does not work with kid’s bed. Others stated that the product is not stable. It is available in a one-piece pack. If you are looking to protect both sides of your child’s bed, then you should consider purchasing two.